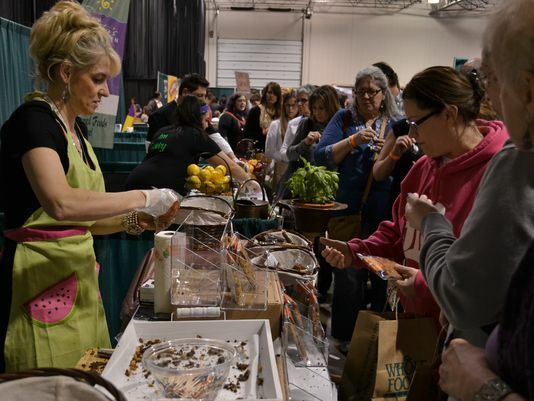 VegFest, one of the largest gatherings of all things vegan, takes place Sunday at the Suburban Collection Showcase in Novi. The event, now in its 19th year, explores the vegan way of life through seminars, guest speakers, food sampling and cooking demonstrations. What started out as a gathering of about 50 people 19 years ago at a suburban school has grown into an event that draws about 5,000 people. This year, guest presenters include Detroit Lion Theo Riddick, who started a nearly all-plant eating plan in the summer of 2017; Dr. Joel Kahn, a vegan cardiologist who is co-owner of GreenSpace Café in Ferndale and GreenSpace & Go in Royal Oak; and Dr. Joel Fuhrman, a nationally known physician who, through research, specializes in preventing and reversing disease via good nutrition. New this year will be several food trucks, including Crepe Day-Twah, the Nosh Pit Food Truck & Restaurant and Shimmy Shack. Cooking demonstrations will be presented by Amber Poupore, owner of the Clean Plate and Cacao Tree Café; Quiana (Que) Broden, a vegan food blogger; Suzy Silvestre, owner of Chive Kitchen in Farmington, and Debra Walter, local personal chef, cooking instructor and graduate of the Culinary Institute of America in New York. Hours for VegFest are 10:30 a.m.-5 p.m. Tickets are $14 online and $17 at the door. Admission is free for VegMichigan members and children 5 and younger. For tickets, memberships and information go to vegmichigan.org.